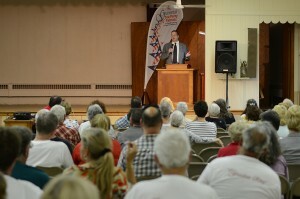 The Greenwich Tea Party Patriots of South Jersey hosted speaker John Horvat II at its monthly meeting on June 3rd near Elmer, New Jersey. Well over 100 people attended the event. The topic of the talk was “Getting to the Core of What Is Wrong With America: The Case for a Return to Order.” Using the example of the Common Core Curriculum, Mr. Horvat demonstrated how sectors of modern culture and the economy are tearing America apart and eroding the Faith. He especially highlighted his book, Return to Order, which explores why America is off track and what can be done to return it to those time-tested principles of faith, family, virtue and especially honor that made America great. 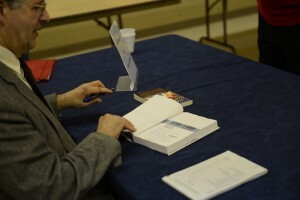 Later, copies of the book were made available and the author signed books and answered questions. This entry was posted in Featured and tagged America, Christian civilization, Family, Return to Order by John Horvat II. Bookmark the permalink.